Set of 4 volumes, book on the 5 Books of Torah. By Rabbi Binyamin Zeev Sofer Zussman of Budapest. 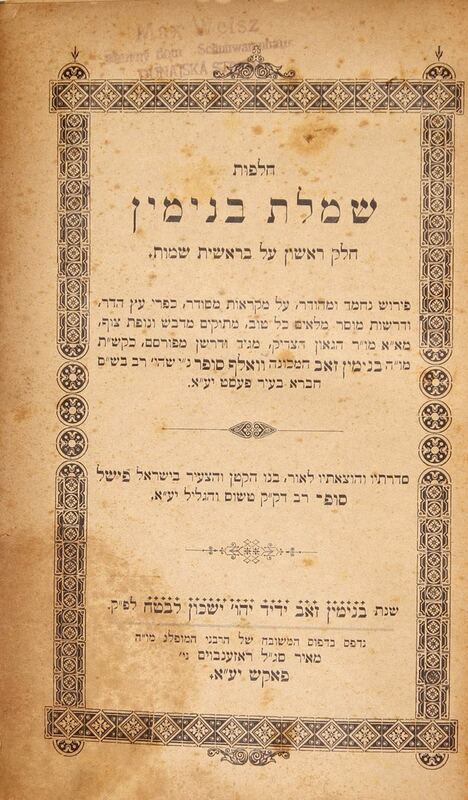 Printed by Meir Segel Rosenbaum between 1896-1901. Half-leather, pretty bindings, with inscriptions on the spine. Rare. | Rabbi Binyamin Zeev Sofer Zussman, Rav of Banady-Wassen and Budapest, grandson of Rabbi Daniel Prostitz. Student of the Chatam Sofer, the Katav Sofer, and Maharam Shik. Though he studied with the Chatam Sofer in his youth for only a short time, he was stringent in standing up whenever he was mentioned. | Stamps. Volume of Genesis-Exodus is missing the cover page. Good condition.